A new Tokyo Tower - 'Tokyo Sky Tree', Japan's tallest man-made structure! Tokyo Sky Tree is expected to soar 2003 feet (610 meters) into the sky over Japan's capitol city by late 2011, making it the nation's tallest man-made structure and, at least for a time, the world's. 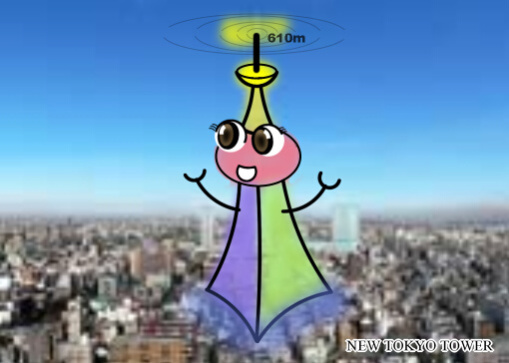 On June 10, 2008, the new tower's official name "Tokyo Sky Tree" was announced. Approximately 33,000 out of 110,000 people participating in a Name The Tower contest voted for the name with five other possible names in the final listing receiving fewer votes. 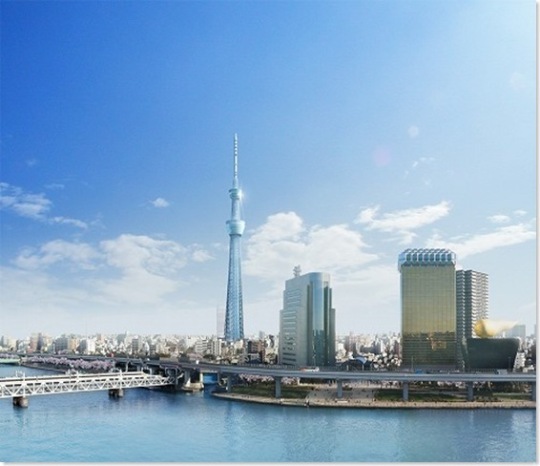 Tokyo Sky Tree will be the centerpiece of a massive new commercial development located in the area of what is now Oshiage Station in Tokyo's Sumida ward. A consortium of six Japanese broadcast companies led by national network NHK proposed and planned the tower, which is expected to be completed in December of 2011. Considering Japan's reputation as a country prone to large earthquakes, the new tower will incorporate the latest seismic engineering techniques but will also recall the balanced construction of Kyoto's five-level pagoda that has stood firm for centuries. The tower will gradually change in cross-section from triangular at the base to round at the 1,000 ft point, the better to withstand strong winds. It is also designed to have a pleasing appearance inspired by Samurai swords (hey, there's a name... the Katana!) that will not clash with traditional Japanese architecture - not that there's much of that left in Tokyo these days. Now yes, there already IS a Tokyo Tower and it's been a city landmark since opening in 1958. Based stylistically on the Eiffel Tower in Paris, France, "Tokyo Tower" stands 1,093 feet (333 meters) tall... very respectable in the Fabulous Fifties but insufficient to meet the needs of today's electronically advanced society. Besides that, Tokyo's modern skyline is dominated by skyscrapers which interfere with signals beamed to and from the now not-so-towering "old" Tokyo Tower. How do we know it's Japanese? It has a face! 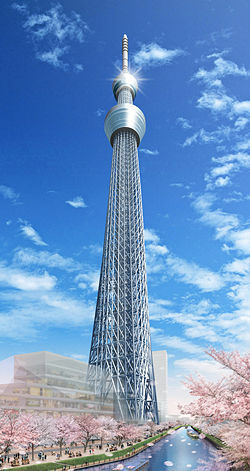 A quote from Tokyo Sky Tree's official website typifies the natural enthusiasm and disarming honesty so often found in Japan and Japanese: "This is a new 2nd broadcasting tower in Japan and will be the tallest broadcasting-tower (Wow! 610 meter / 2000ft) in the world, if the construction is completed successfully." That's a big "if"... c'mon guys, show a little confidence! I had read about this but wasn't sure if it was true. Thanks for this info - and wow - that's quite a project. It will be interesting to see it go up that's for sure. I'll have to see this next time I'm there. Japan is like an episode of Futurama. I never cease to be amazed by it.